Today I shot 79 at Coal Creek – my first round in the 70’s in several years (I haven’t been there consistently since 2006). The lessons I took this year have definitely helped. I wasn’t expecting much today. I’d taken my daughter to the driving range yesterday and really hacked it up. I was late to the course and teed off without any warm-up. But it all worked out. 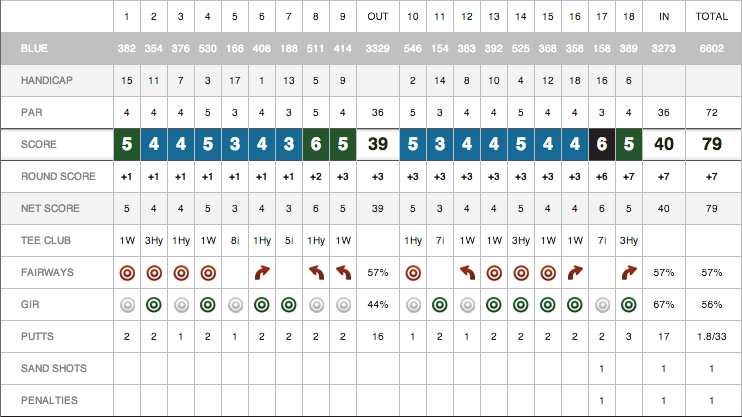 That 17th hole was painful, but a round in the 70s with no birdies and a triple bogey? I’ll take it.